It has been a quarter of a century since Ravi Shankar and Philip Glass collaborated together and composed “Passages” – a superb fusion of traditional Indian and Western music, separated into six parts. 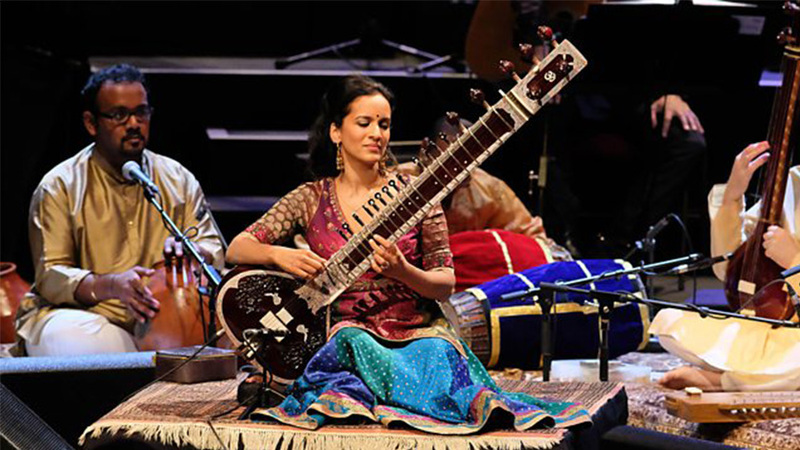 Today, it is Shankar’s devoted daughter Anoushka who performs with a sitar. Proudly and skilfully, she follows the footsteps of her father playing with world-class orchestras across various genres. Tonight (15 August), it was at the BBC Proms. “Passages” has never been performed outside of a studio, live, yet, despite the limited rehearsal time, the Late Night Prom was an electrifying and thrilling event. Prommers enjoyed themselves so much that some danced the evening away in the middle of the pit with little hesitation. It is a mesmerising masterpiece, not only for the ears of its audience but for the musicians performing the work, too. They undergo a culture shock given the challenges that Passages – a complex duality of two traditional genres – bring. Listen and watch as Eastern and Western music compositions merge and transform, all of which was successfully achieved during the BBC Prom’s night (41). Renowned sitar player Ravi Shankar is celebrated as ‘the godfather of world music’. He had a huge influence on a generation of diverse and eclectic musicians during the 1960s, introducing hypnotic sounds and music elements of India to the West. In doing so, he left behind a legacy that saw him work with 20th century minimalist composer Philip Glass, during the 90s, as well as The Beatles, in the Swinging Sixties. Glass took it upon himself to explore the Indian subcontinent at the time, and slowly he became enamoured by the ‘apparent chaos’ of Indian music. Indian music’s beat patterns, structures, rhythm and connectivity to meditative states affected Glass greatly that his music never sounded the same again. We can hear Shankar’s direct and indirect influences in Glass’s operas, Akhnaten and Satyagraha, through the repetition, complex composition and orchestration. It goes back to the time they collaborated on the music for the film Chappaqua. During the evening Prom, Anoushka lead a small band of talented Indian musicians while the Britten Sinfonia showed their mettle under Kamensek’s baton. Whatever you know of Glass’s music, it is here, reflected through the saxophone, cello, flute, clarinet, trumpet and more. And somehow the two genres flow smoothly. Shankar and Glass made this possible. The first movement ‘Offering’ is heavily Western, yet it was Shankar who composed the saxophone melody that leaves the audience feeling pensive and sensitive. The second movement ‘Sadhanipa’ wheels the audience in with a gentle sitar solo that slowly unfolds with brand new sounds from Western instruments. It is the first obvious hearing of both Indian and Western music working compatibly in unison. Soprano Alexa Mason sings in wordless voice to enhance the emotions in the sophisticated music, welcoming in the buoyant fourth and fifth movement which dissects the Eastern and Western techniques. The most emotional part is the last movement ‘Prashanti’ with spiritual text vocally sung by Ravichandra Kulur. It is a peaceful and meditative section that has the most authentic and touching music. Everyone at the Royal Albert Hall took home something that night – a unique experience blending eclecticism, enlightenment, and minimalism all into one. Thanks to the BBC Proms a live performance of Passages was attainable.